Get a sense of the moon. Go out and find water that is large enough to see the Full Moon's shadows and reflections in the water on a clear night. Gaze at the water and absorb the light of the sun in the water through the Moon's reflection. If you need to talk to yourself, do. Don't feel silly. Sometimes it can be a big help just to hear your own voice, to follow its rhythms when out in nature, and to feel the power of where you are standing with all this surrounding you. Here you are on a planet somewhere in the universe of unknowns, and you can see it right where you are standing. You can touch it with your eyes. Try to do this meditation several times before you begin Chandranamaskara. I know it's a long foreign word, but it is so easy to pronounce: Chandra (like panda) —nam (like some) —a (short a) —skara (like bar). Chandra-nam-a-skara. just the way it looks, and it is quite pleasant to utter. Try. If it is too hard, at least you will get a good laugh out of it. While studying psychology at the University of Stockholm, one of our experiments was to interview a young child about their relationship with the Moon. I did that with Suvi Asch (she's now an incredible woman and a great artist, too). She was about 4 years old at the most. We sat in the kitchen where she lived and looked at the Moon bright in the sky to our right, outside the window. I asked her what she thought about when she looked at it and she said, “If I put my finger right here (as she pressed her finger on the window just where the Moon was) I can touch it. It is right here.” She said this with a huge smile as she leaned into the window. I never forgot how it felt to sit there and listen to her and realize that she was right. It was right there and she could touch it. Take a walk by a body of water with waves. Sit down and watch the waves. As the waves rise and land on the sand in front of you, inhale and feel the energy of the Moon as its light energy enters your head. When the water recedes and returns to the body of water where it came from, exhale and feel that energy being pulled out of your body, out through your head and into the body of water. As it does this, you feel lighter and lighter in your body. Your body becomes agile, soft, flexible. After you have done this several times, try to have this image and feeling in your mind as you do The Moon Salutation. Memories of what you see outside that have a great impact on you—inside—are really worth using for meditations. Doing this makes it easier to release tension and to feel more relaxed instantly. As I was doing my research for this article, I came across a site with a great image that really puts it into perspective. National Geographic.com reports that “the moon is the Earth's only natural satellite and its nearest neighbor in the solar system. 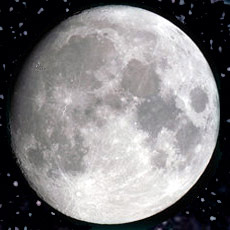 The diameter of the moon is about 2,160 miles (3,476 kilometers), basically one-fourth that of the of the Earth's diameter. The moon's gravitational pull on the Earth is the main cause of the rise and fall of ocean tides.” This is something we learned in school, but how often did you sit on a beach at night and watch the Moon and the ebb tide (the flowing back of tidewater to the ocean). Think of this, too, while you are doing The Moon Salutation—about the ebb tide within you. So, the Moon orbits the Earth roughly once a month. Looking down on the Earth and Moon from above the Earth's north pole, we see that its revolution is in the same direction as the Earth's rotation (and also the Earth's revolution around the Sun). The Moon shines by reflected sunlight. Therefore, at any time only one half of the Moon, the side facing the Sun, is illuminated. The dividing circle between the light side and the dark side is called the terminator. The illuminated side of the Moon is not necessarily the half which faces the Earth. Depending on the relative positions of the Sun, Moon, and Earth, we see different fractions of the Moon illuminated. These are called the phases of the A full moon rises around 6pm, is overhead at midnight, and sets around 6am. A first quarter moon rises around noon, is overhead around 6pm, and sets around midnight.